The Wilderlands refers to the original setting by the Judges Guild for OD&D. The Wilderlands of High Fantasy describes the setting as detailed in the D20 Edition and was published by Judges Guild/Necromancer Games. Does this more or less cover it? Are these versions of the setting compatible or do they represent different continuitites? Re: Wilderlands of High Fantasy / Majestic Wilderlands / Fantastic Wilderlands and more? I'm certainly no expert but you have the same list I do of Wilderlands product lines to investigate. I think there is a scale difference with one of the versions of Wilderlands. (Same map, but bigger or smaller.) I forget which one, but it's not going to be Necromancer, as that was supposed to be a continuation of the Judges Guild stuff. There was some sort of legal dispute with the Necromancer stuff. I was hoping that it had reverted to Judges Guild, so they could put it out as Print on Demand reprints, but it might be something that never gets reprinted. There were the original Wilderlands products published by Judges Guild; this is, as a whole, considered the "Wilderlands of High Fantasy," though originally only the first book had that title (the other books were Wilderlands of the Magic Realm, Wilderlands of the Fantastic Reaches, and Fantastic Wilderlands Beyonde). = Necromancer Games published an expanded 3E/d20 version of it in the boxed set called the Wilderlands of High Fantasy. This included all the information from the four Wilderlands books, plus materials from the CSIO, CSWE, Modron, and the Wilderness books. But it was still, for all intents and purposes, the Wilderlands as presented by Judges Guild. = Rob Conley's current Wilderlands project is a re-presentation of the original Judges Guild material, cleaned up, edited, and with the regional map material from the CSWE included (in book 2, as it is Map 6), with a few other minor additions from other materials, presented for use with Swords & Wizardry. Otherwise, it is essentially the same material as in the original Judges Guild products. 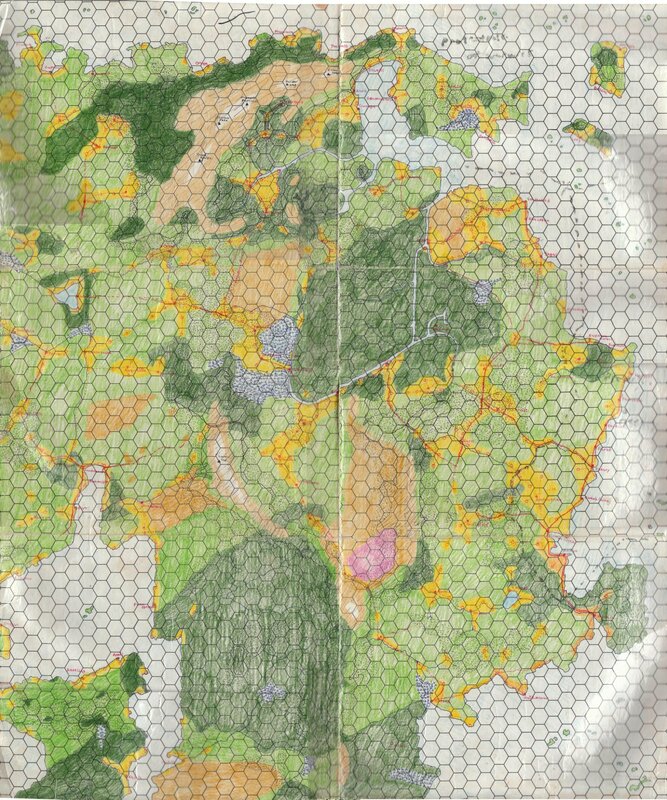 Wilderlands of High Adventure was my version of the Wilderlands, as developed for use with Castles & Crusades. The scale is the same, and nothing in my materials directly contradicts existing material or seriously changes the world, it merely adds to and extrapolates from it. Plus, the Rhadamanthia map I published was directly from Bob, with some assistance on my part, so that was, from Bob's point of view, as official as it got for the continent of Rhadamanthia. The Majestic Wilderlands is from Rob Conley. This is the most divergent of the published Wilderlands series, as it is based on his long-running campaign. IIRC, it even has 12.5 mile hexes, though I could be wrong on that. = Rob Conley's current Wilderlands project is a re-presentation of the original Judges Guild material, cleaned up, edited, and with the regional map material from the CSWE included (in book 2, as it is Map 6), with a few other minor additions from other materials, presented for use with Swords & Wizardry. To make sure I'm understanding correctly, both Majestic Wilderlands and Fantastic Wilderlands are from Rob Conley and are written for S&W. Majestic Wilderlands is presumably an older product line, and varies quite a bit from the original material, whereas Fantastic Wilderlands is the current product line, and is true to the original? Did I summarize that correctly? Tim, yes, that is the basic summation. So what is your vision of Majestic Wilderlands? My vision of the Majestic Wilderlands is a quasi realistic design. In this respect it is similar to settings like Harn, Tekemul, and Glorantha where the author(s) have put a lot of work into making the races, cultures, and religions fit together in a way that make sense given the premises. The difference between the Majestic Wilderlands and the other settings I mentioned is that I adhere closely to the tropes of AD&D. I have orcs, elves, dwarves, and quite bit of magic. However, it not a mythic place, but grounded in quasi-realism. How it differs from the Wilderlands of High Fantasy is that the Majestic Wilderlands is a fuller world. It is not isolated city-states separated by miles of howling wilderness. Instead it is divided into various realms dominated by different cultures and races. But there isplenty of wild land yet to be claimed. There are miles of wilderness to challenge the hardy adventurer. It is a larger than the Wilderlands of High Fantasy. The scale has been expanded from 5 miles per hex to 12.5 miles per hex. The entire area of the Majestic Wilderlands encompasses nearly a continent. Sure although for my part I use original WoHF as well. [*]The Wilderlands of High Fantasy describes the setting as detailed in the D20 Edition and was published by Judges Guild/Necromancer Games. Not sure where this originated. I been calling it the X, the revised* edition. With X being the original title of the book being revised. Hence Wilderlands of High Fantasy, revised; Fantastic Wilderlands Beyond, revised. And within the next couple of weeks, Wilderlands of the Magic Realms, revised. And winding up with Wilderlands of the Fantastic Reaches, revised. Revised in the sense it been edited and laid out to today's standards. Are these versions of the setting compatible or do they represent different continuitites? MW and WoHF are my and James take on the setting so are their own thing. The original Wilderlands, WoHF, and revised editions are meant to be the same thing. Although the WoHF is a bit weak because it's content is not free to use by Judges Guild. So probably winds up to be considered it own thing. I know the City State of the Sea Kings contradicts WoHF and previously published info on the Wilderlands. The situation is why I am doing a minimalist approach to the revised edition. My "Map Notes' with the idea to point out features of each individual map and give a possible interpretation. And generally I only go for the obvious stuff. Also I try to incorporate any detail found in any other original publications. That would be my Majestic Wilderlands. I use 12.5 miles per hex or 5 leagues or 5 hours of walking. This is a section just south of the Gnome Kingdom of Lightelf. This is a scan of the hand draw version where my setting shifted to the Majestic Wilderlands in the late 80s. Again scale 12.5 mile per hex. Mapping style similar to the one used by Harn where terrain are fills (like dots for hills) and vegetation is color. Nope you got it right it 12.5 miles per hex. Born from when the players went from City State to Viridistan and it only took a few days. They were surprised it didn't take long to get there and told me they always thought it was bigger. So the next campaign, I made it bigger to 12.5 miles because then I can use some of the system agnostic rules from Harn for travel and adventures. Then it got rationalized and baked in when I redrew the maps, by hand, as they were were falling apart and crumbling. As shown in the attached image in the previous post. ... and Fantastic Wilderlands are from Rob Conley and are written for S&W. Again revised editions. It written for Swords & Wizardry because it closest to the OD&D + Supplements rules the original used. I also used Swords & Wizardry for the Majestic Wilderlands because it System Reference Document (by Matt Finch) that I could edit, copy, and paste, was the closest thing to an ur-D&D the hobby had that was open content. After Wilderlands of the Fantastic Reaches is released I will be sending the files for the revised edition to Judges Guild so that nobody else has to do what I had to do again. Also I releasing them piecemeal in the original order to keep it affordable. The downside is stuff like this thread where people ask about what is what in terms of the Wilderlands. Mmm I need to update the site and FAQ to include the revised stuff.